Most know director James Wan for his massively successful horror films Saw, Insidious and this summer's The Conjuring, but one of his best films to date is the 2007 action thriller Death Sentence, starring Kevin Bacon. So it shouldn't come as any surprise that the young auteur has been asked to jump behind the wheel on the in-production Fast & Furious 7, which will be in theaters only one year after Fast & Furious 6 proved to be one of this summer's biggest hits. 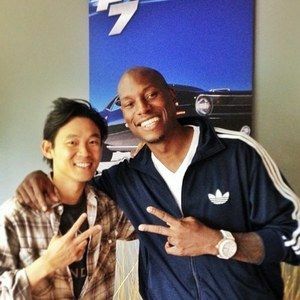 James held down a six hour production meeting last night, and has sent out a photo, alongside star Tyrese Gibson (Roman Pearce), teasing the first poster. He also sent out a tweet calling the meeting 'epic'. Check out the fun as these guys set out to create another exciting installment in a franchise that only seems to be getting bigger and better with each new movie. "Last night's production meeting went for about 6 hours. From 7pm to 1am. #epic"